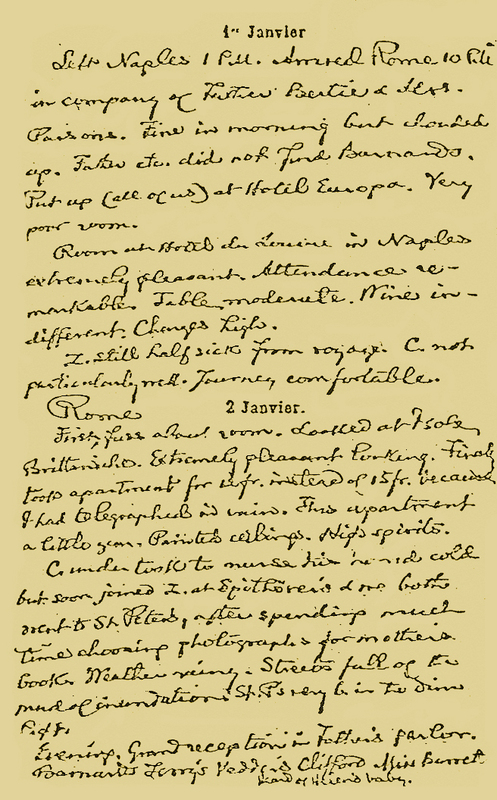 January 1-January 2 1871 (C. S. Peirce y Zina Fay, MS 1614, p. 5)"
Left Naples 1 PM. Arrived Rome 10 PM. in company of Father, Bertie, & Mrs. Parsons. Fine in morning but clouded up. Father etc. did not find Barnards. Put up (all of us) at Hotel Europa. Very poor room. Room at Hotel du Louvre in Naples extremely pleasant. Attendance remarkable. Table moderate. Wine indifferent. Charges high. Z[ina] still half sick from voyage. C[harles] not particularly well. Journey comfortable. First, fuss about room. Looked at Isole Brittaniche. Extremely pleasant looking. Finally took apartment for 12 fr. instead of 15 fr. because I had telegraphed in vain. This apartment a little gem. Painted ceilings. High spirits. C[harles] undertook to nurse his horrid cold but soon joined Z[ina] at Spithöver's & we both went to St. Peter's, after spending much time choosing photographs for mother's book. Weather rainy. Streets full of the mud of inundation. St. P's very b[eautiful] in the dim light. Evening. Grand reception in Father's parlor. Barnard's Terry's Vedder's Clifford Miss Barrett.